BluSynergy supports the following Payment Gateways / Payment Processors with the high-level features supported. The payment processor is configured using the [System >> Payment Processor Configuration] menu and the essential configuration fields are noted below. Note that depending on the selected processor, the field names may adapt (change) to reflect the nomenclature used by that processor. Using the "Payment Processor" list box, select the processor that you have signed up with. Fig 2. 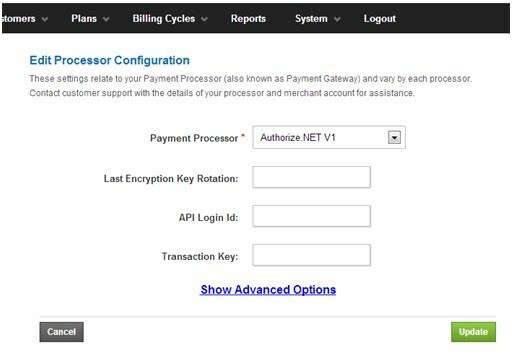 Advanced options for the payment processor configuration. Primary URL Y The URL provided by your payment processor. Note that most processors will have a production (or live) URL as well as a staging (or test) URL, so it is important to set the URL correctly depending on whether you are testing or live. Clicking on the "use default production link" will set the URL usually used by the selected payment gateway. 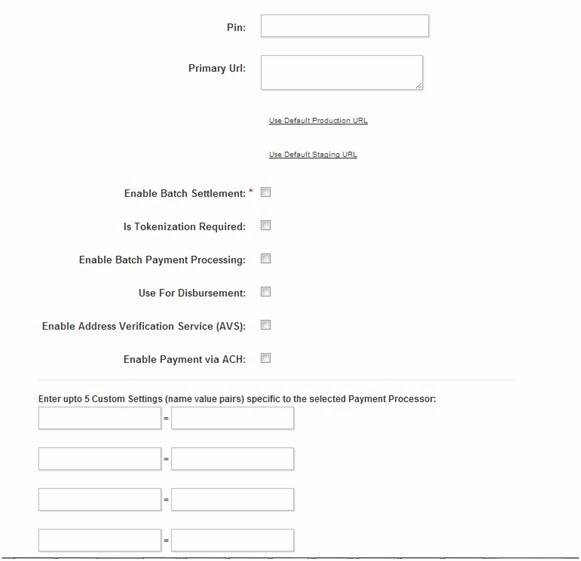 Enable Batch Settlement N In this mode, payments will be first authorized in real time and then settled ("captured") in batch mode during the night. Contact support if you require this feature. Tokenization N If tokenization is enabled, then the sensitive credit card and ACH (bank) information is stored on the payment processor's systems instead of storing them in BluSynergy. Ensure that this feature is supported by your selected payment processor and that you have signed up for this service. Batch Payment Processing N In this mode, the automatic payments are processed in batches, instead of discrete transactions. Contact support if you require this feature. Use for Disbursement N If payments will be disbursed via this processor (e.g., commissions or royalties), then this option must be selected. Enable AVS N If you configure Address Verification Service as a required option within your processor settings (by logging into your processor's website), then enable this option so that BluBilling will display the fields for the billing address along with the credit card fields. Enable ACH N If your processor supports electronic check payments and you have signed up for this option, then select this option. Custom Fields 1 to 5 N Processor dependent settings. Click on the links below to review additional configuration settings for these payment processors. When configuring a payment processor for the 1st time, we recommend the following test use cases. For the first pass, we recommend you test against the processor's staging/test environment and for the second round, we recommend testing against your processors' live/production environment using small amounts (eg. $1.00). This is a critical step since you will often find that transactions working fine in the test environment (such as tokenization, account updater, ACH etc.) are being declined in the production environment since separate enrollment is required. Test a payment using each of the major credit card types that you support (Mastercard, Visa, Discover, Amex). Note that test card numbers that will NOT work in the production environment. Find a successful payment and attempt a refund. Do this for both Credit Cards and ACH (if applicable). If AVS is enabled on your merchant account, then test and verify expected results when you provide the billing address and when you do not provide the billing address. If CVV (Card Validation Value) is enabled on your merchant account, then test and verify expected results when you provide the CVV and when you do not provide the CVV. In the BluBilling system, save the card (or ACH) to the Customers profile and then attempt to make a payment using this saved card. If using tokenization, then verify that the above step created an entry in your merchant account for the new card. At the end of the day, compare reports in BluSynergy (Payment detail report) against the reports available on your processors' system. Verify funding by monitoring your bank account and understand the funding cycle (usually 1 to 2 business days) and the settlement mode used by your acquirer (gross settlement vs. net settlement). 3. ends with 0.33 FAIL Returns a system status of error. errorMessage: "Communication link failure (simulated)"
This error may also be simulated by using an expiry date of "12/31/2098"
4. ends with 0.66 DECLINE Returns a system status of declined.